I’ve always felt US China relations would always be peaceful as long as we remain as economically intertwined as we are. The brewing conflict between China and Japan might change everything though. This week senior American officials rushed to Tokyo to urge caution on Shinzo Abe’s hawkish new government. America is obliged to come to Japan’s aid if it is attacked, and being sucked into a conflict with China is almost too unbearable to contemplate. The two countries appear locked in a finger-pointing game and it’s unclear if anything short of ceding control of the islands to China will mollify them. China seems unwilling to entertain other perspectives or interests. The sources of this chauvinism are not entirely clear. It may be that the government is responding to the ultra-nationalist sentiments that people increasingly give voice to on the internet. The Economist is even drawing comparisons between the current China stance and the climate that saw Japan wage war across east asia during World War II. East Asian parallels from a century ago are hard to ignore. Then, as justification for continental expansion, a bullying Japan drank from a dangerous brew of nationalism and a manufactured sense of foreign aggression and victimhood. As China pursues a policy of maritime expansion, the rhetoric of victimisation is remarkably similar. The coming clash that China now talks about could be as calamitous as that previous one was. It would imperil not just China’s but the region’s peace and its momentous economic advances. 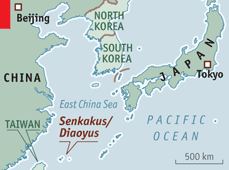 You are currently reading China and Japan edge closer to war | The Economist at Thomas Paine Rants.